Fushimi Falls (伏見ヶ滝, fushimigataki) is one of four great waterfalls of Higashiyama Onsen. 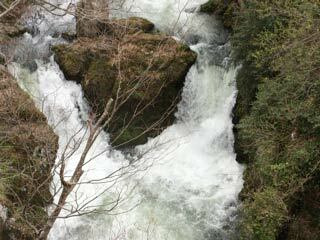 It is consisted with two waterfalls. Upper falls is called Odaki, and lower falls is called Medaki. Odaki is 5m tall, and Medaki is 6m tall. There is no parking, but not far from town parking. There is observatory near Odaki.